Suzy was drawing the sketch of Gong Yoo, showing perfectly her drawing skill. Suzy who is receiving attention because of KBS 2TV miniseries “Big” suddenly inspired to draw the pencil sketch of Gong Yoo during poster autograph. Not only she exuded shrewdness of young girl, but also perfectly showcased the extraordinary drawing skill. Gong Yoo in the portrait has a clear facial features, and looks vivid. 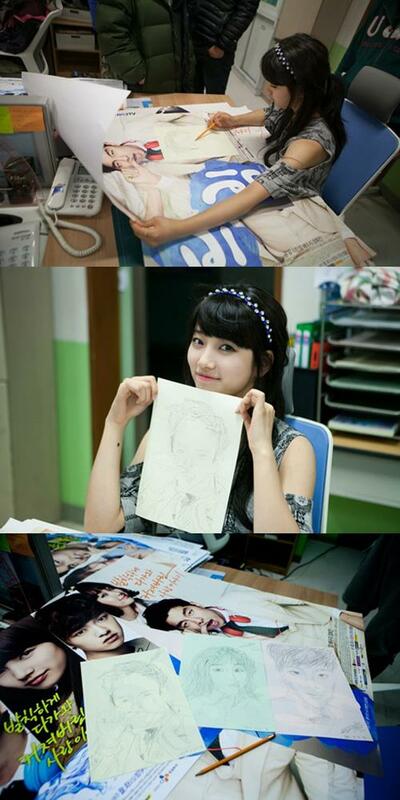 Not only that, Suzy also created the sketched portraits of Lee Min Jung and Shin Won Ho at a short period of time. Although it’s not a masterpiece, but sketches show fully everyone’s characteristics, making everyone could not help but to overcome with emotions about the drawing skill of the small beauty.